Bolshoi Theatre has always been and remains one of the major symbols of our great nation and its culture. The only way for the Bolshoi to stand for its name is to facilitate steady and fast artistic growth based on all of the development factors: internal and external, traditional and modern, national and international. The history of music theatre development worldwide has proved that steady and rapid development of the theatre company has to be warranted by the high quality productions that are comparable to the highest international standards. This requires new ideas and new approaches to creative work as well as new technological level on the production side. Bolshoi has proved in the last three years that it is capable of challenging itself artistically, and meeting such challenges. Among the major productions of the recent seasons are operas Khovanschina by Modest Musorgsky, The Snow Maiden by Nikolai Rimsky-Korsakov, Ruslan and Lyudmila by Mikhail Glinka, Mazepa by Pyotr Ilyich Tchaikovsky, The Rake's Progress by Igor Stravinsky, The Gambler and The Angel of Fire by Sergei Prokofiev, Adriana Lecouvreur by F. Cilea, The Force of Destiny and Macbeth by G. Verdi. The Flying Dutchman by R. Wagner, Lady Macbeth of Mtsensk by D. Shostakovich; and ballets The Swan Lake by P. Tchaikovsky, The Legend of Love by A. Melikov, Raymonda by A. Glazunov, The Bright Stream by D. Shostakovich, Romeo and Juliet by S. Prokofiev, The Queen of Spades and Notre-Dames de Paris by Roland Petit, one-act ballet by George Balanchine and modern Russian choreographers.. Since the beginning of the 21st century, after a long break, the theatre repertoire started including the masterpieces of Russian composers of the 20th century seen nowadays as the national classical heritage. In the recent years the Bolshoi has introduced the audiences to the operas The Gambler and The Fire Angel by Sergei Prokofiev, Lady Macbeth of Mtsensk by Dmitry Shostakovich. as well as to the ballet The Bright Stream by Dmitry Shostakovich. Soon another opera by Sergei Prokofiev, War and Peace, will join the repertoire. In the centennial year of Dmitry Shostakovich all three of his ballets, The Bright Stream, The Bolt, and The Golden Age, will be represented in the playbill of the Bolshoi for the first time in history. As part of its day-to-day activities Bolshoi is continuously developing numerous educational projects. The Gurre Songs by Schцnberg has been premiered in Moscow for the first time; The Damnation of Faust, a dramatic legend by Hector Berlioz, was presented in concert setting; 15 concerts of the prominent ensembles and soloists took place as part of the Chamber Series at the Bolshoi. The recent revival of the Bolshoi Symphony concert series at the New Stage as well as the Grand Hall of Moscow Philharmonics has gained tremendous popularity among the audience. The success of our touring performances is hard to overestimate. Bolshoi Ballet has performed in London and Paris; the orchestra and chorus have traveled to Spain and Portugal; the opera company has been seen in Warsaw and Riga. We have managed to reestablish productive partnership with the National Opera in Paris, with Covent Garden and La Scala, with Polish and Latvian National Opera Theatres, and with the Florentine May Music Festival among others. For the first time in Russian history we have co-produced The Flying Dutchman with Bayerische Staatsoper, one of the major European opera companies. Bolshoi has received the State Award for Arts for its prodiction of The Queen of Spades and was honored with five Golden Mask National Theatre Awards for the productions of The Queen of Spades, The Rake's Progress and The Bright Stream. Dmitry Chernyakov, the director of The Rake's Progress, was the first music theatre director to receive the prestigious Stanislavsky Award. The crucial phase of the renovation of the Bolshoi historic building started in September 2004. The preparations took many months, and the advance of the renovation will now be visible to each and every audience member. 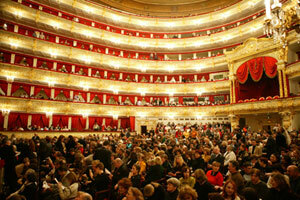 Between September 2005 and December 2007 Bolshoi performances in Moscow will take place only at the New Stage. It is expected that the company will be able to start using both the Main Stage and the New Stage in 2007-08 season. The renovation of the Bolshoi is aimed at preservation of the historic architectural ensemble of the theatre. 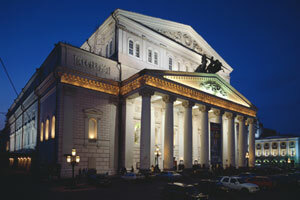 The goal of the stage equipment renovation is to facilitate the creation of the world-class productions at the Bolshoi. Some world's major theatres, such as La Scala and Covent Garden, have undergone similar renovation recently. Without jeopardizing any of the exemplary artistic values these companies have managed to bring their stage equipment and technology to the level that meets demand and expectations of the world's leading conductors, directors, designers and choreographers producing with regards to producing highest quality theatre at the beginning of the 21st century. The new phase of renovation of the historic premises occupied by that Bolshoi poses a major challenge for the leadership of the theatre. Their goal at hand is to preserve and further develop the artistic advancement of the renowned company without compromising the frequency of performances and the intensive schedule of new productions of Russian and Western masterpieces. In 2006 Bolshoi will be engaged in the major touring arrangement, Bolshoi to Russia, that will take company's major productions to various Russian cities. The Management of the Bolshoi would like to make it very clear that the full-range artistic activities of the company will not in any way be compromised by the ongoing renovation of the premises. The main objective here is to ensure the artistic growth of no. 1 theatre in the nation by maintaining the intensive performance schedule and intensifying new production activities. Bolshoi Theatre is the national theatre of Russia, the quintessence of the Russian musical tradition and the international center of the music culture. Its goal is to place the classical heritage into the context of changing cultural demand of the Russian society, and to advance and develop the music theatre in Russia. Priorities in the repertoire development include both staging the masterpieces of the Russian musical theatre of the 19th and 20th century, and conceiving the new work that would advance the art of opera and ballet in Russia. 70 per cent of the repertoire is comprised of the works by the domestic composers. This balance will be carried on into the future. - Classical masterpieces of the national music theatre of the 19th and 20th centuries (produced or scheduled to be produced the operas: Mazepa, Eugene Onegin, The Queen of Spades by Tchaikovsky; . Khovanschina, Boris Godunov by Mussorgsky; The Gambler, The Fire Angel, War and Peace by Prokofiev; Lady Macbeth of Mtsensk by Shostakovich; the ballets: Sleeping Beauty by Tchaikovsky, Romeo and Juliet and Cinderella by Prokofiev, The Bright Stream, The Bolt and The Golden Age by Shostakovich; ballets of Leonid Myasin, etc. - Commissioning of the modern operas and ballets, developing new work as the means of advancing the musical theatre (i.e. world premiere of The Children of Rosenthal by Leonid Desyatnikov; work of modern Russian choreographers; inviting younger generation of Russian choreographers to stage original work. - 4 operas and 3 ballets from 2007-08 season onward. The theatre is working patiently to improve the artistic functionality of the company. It strives to further develop the younger talent within the Bolshoi and overall to compile a diverse company that could meet nearly any artistic challenge. Bolshoi is offering guest appearances to the performers from other cities of Russia, as well as from abroad, provided such performers are able to stand the utmost demanding criteria set forth for the resident company members. The theatre bears responsibility of preserving the traditions of the national opera and ballet of Russia, and further advancing these traditions in line with the artistic demand of the society at its current stage of development. The ‘golden fund' of national music culture has to be present in the Bolshoi repertoire at any given time, while the repertoire itself has to change continuously using the latest achievements of the source studies, musicology and theatre history. In consideration of the above the operas Ruslan and Lyudmila by Glinka, and Mazepa by Tchaikovsky, as well as ballet The Bright Stream by Shostakovich were staged. They are soon to be followed by the original edition of Lady Macbeth of Mtsensk by Shostakovich, Eugene Onegin by Tchaikovsky, War and Peace by Prokofiev, and the revival of all three Shostakovich's ballets: The Bright Stream, The Bolt and The Golden Age. Theatre's touring is limited to the venues comparable with the name and history of the Bolshoi (Paris National Opera, Covent Garden, Metropolitan Opera), and is cooperating with the leading international agencies. Bolshoi is oriented primarily to the domestic audience. It offers the variety of repertoire choices ranging from the national classics and worldwide masterpieces of music to the new work as well as chamber and symphony concerts. Theatre's priorities include quality performance schedule and producing the new work rather than touring. Theatre is a live organism that develops itself alongside with the nation while continuously searching for the new artistic ideas. At the current stage of social development the theatre facilitates the establishment of new aesthetic priorities in the art of opera and ballet, especially when it comes to national repertoire. Theatre not only is meeting the social demand in the classical art, but is also developing and forming the tastes of the audience, allowing the theatergoers to become familiar with the most prominent achievements of the music theatre. Familiarizing the audience with this context is among the main goals of the Bolshoi, seen by the state as the channel of its applied social mission. Theatre doesn't exist without the audience. The theatre of nowadays, contemporary and competitive, has to outrun the tastes of the audience, introducing the domestic theatergoers to the context of the world's music theatre. Theatre also serves as the link between the Russian and international music cultures as it sets forth the production standards of the Russian classical repertoire. Based on the most recent achievements of music and theatre history, the Bolshoi is rethinking the production style of the Russian opera trying to set a new standard that will allow to properly represent our classical heritage worldwide. Theatre is strengthening its international relations by renting the best productions from other companies as well as engaging in co-productions with the world best music centers. This cooperation with the world's most prominent theatres and artists reaffirms that Bolshoi is the integral part of the international music context. The theatre is exercising its educating activity by performing otherwise rarely produced work and collaborating with the most prominent soloists and directors. Theatre has already cooperated with such directors as Francesca Zambello, Eimuntas Nekrosius, Declan Donnelan, Robert Sturua, Peter Konicny, Temur Chkheidze, and choreorgraphers such as Roland Petit, John Neumayer. Our immediate future plans include collaboration with directors Robert Wilson, Graham Week, Alexander Sokurov, Achim Freyer, conductors Mstislav Rostropovich, Maris Jansons and others. Theatre's special attention is educational program for the youth. These programs have to do with developing the national pride and artistic taste in younger generation, and making sure that theatergoing becomes vital part of their life. We are working on development of the "Society of the Bolshoi Friends" that should be formally established by the completion of the Bolshoi renovation. Educational series promoted by the Society will include special lectures and audience conferences on each of the openings, theatre tours and Bolshoi Museum visits. Integral part of the Bolshoi activities is the ongoing series of chamber and symphony concerts, as well as presenting operas in concert-style performance, that allow us to offer the whole variety of music genres to our audiences.